The Buried Giant by Kazuo Ishiguro, reviewed. Kazuo Ishiguro’s first novel in 10 years is a sad, remarkable fantasy story set in Arthurian England. Here, in no special order of importance or chronology, are some things that happen in Kazuo Ishiguro’s new novel: An old man uses a hoe to fight off thousands of pixies who have attacked his wife as she floats down a river in a basket; an enchanted mist envelops a country, causing an entire people to forget its past; an ogre is found in a ditch, gravely indisposed, having killed and partially eaten a poisoned goat; an ancient widow prosecutes a grievance with a mysterious boatman by methodically slitting the throats of rabbits and spilling their blood on the floor of his childhood home; a past-his-Green-Knight-beheading-prime Sir Gawain faces off against a hell-dog in an underground chamber. These elements of plot ought to give you some idea of the kind of thing you should expect from The Buried Giant, Ishiguro’s first book in the decade since his extraordinary masterpiece Never Let Me Go. But they should also give you a picture of the kind of thing you should not expect. Bluntly laid out like that, in the cold light of a book review, all that stuff looks (and, I suppose, is) a bit unhinged, seeming to suggest the kind of haphazard narrative that sends its characters scuttling from one fantastic crisis to the next in a frenetic struggle to divert and stimulate its readers. But the overwhelming effect of The Buried Gian—from sentence to sentence, from first page to last—is one of quiet and restrained sadness. That is to say that The Buried Giant is is a fantasy novel in much the same sort of way that Never Let Me Go was a sci-fi yarn—or, for that matter, that When We Were Orphans was a detective novel, or The Remains of the Day was a historical romance: very much so, but also hardly at all. Ishiguro is in full genre-occupying mode here, settling an imaginative region, capturing its tropes and conditions, and establishing within it his own peculiar sovereignty. At the center of this story are Axl and Beatrice, two elderly Britons who live on the outer fringes of a sprawling warren of interconnected huts. Although they are technically part of a community, their existence on its margins is a lonely and meager one. They are treated unkindly by others in the settlement, and forbidden from keeping a candle in their hut, for fear that their unsteady old hands might prove a fire hazard—a prohibition that means they spend much of their lives in near total darkness. But Ishiguro soon begins to reveal a larger and more troubling darkness: Axl and Beatrice can remember almost nothing of their pasts. Certain phantoms—of losses, betrayals, people who once figured large in their lives—flicker weakly, like guttering candlelight, and are gone. And this amnesia affects not just the elderly couple, but the community as a whole, though few others seem troubled by it. “You may wonder why Axl did not turn to his fellow villagers for assistance in recalling the past,” suggests our attentive narrator, “but this was not as easy as you might suppose. For in this community the past was rarely discussed. I do not mean that it was taboo. I mean that it had somehow faded into a mist as dense as that which hung over the marshes. 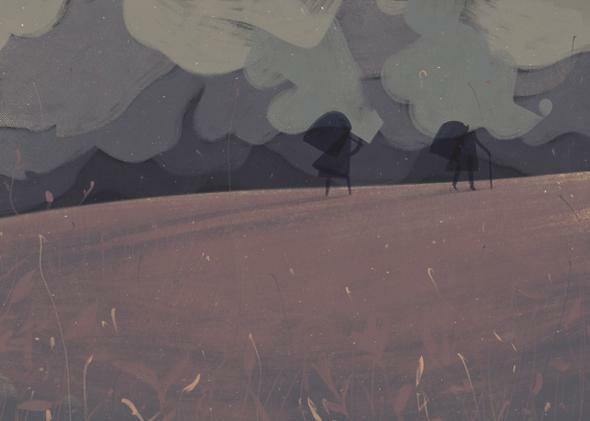 It simply did not occur to these villagers to think about the past—even the recent one.” It soon becomes apparent that the literal mist that hangs over the country is directly responsible for the epidemic of forgetting. (I won’t be the only reader to think here of José Saramago’s novel Blindness, in which the population of an entire city suddenly and inexplicably loses its sight.) As anyone who has read Never Let Me Go will be aware, Ishiguro is an exceptional fabricator of these kinds of mechanisms—narrative conceits which loom into view on the scale of radical metaphor, but nevertheless retain a deep and vital opacity. I found myself thinking frequently, in the early pages, of our own culture of forgetting, of the endless media churn which often seems a cause of indifference and moral torpor; but as the novel progressed I began to relinquish that reading, or qualify it, and the mist seemed suggestive of some deeper historical current of erasure. The couple comes increasingly to believe that they once had a son, and then that they still do, and Beatrice is soon insisting that he in fact lives in a village a few days’ walk from their own. Their departure for that village sets in motion the episodic quest narrative at the heart of the book. As these elderly pilgrims make their careful way across the countryside, it becomes apparent that some drama of a larger scale than their search for their son is unfolding in the theater of England. When they arrive in a Saxon village not far from their own Briton settlement, a central division running through Ishiguro’s imagined country begins to reveal itself. Relations between the two peoples are technically peaceful, but distinctions of language and religion (the Saxons are pagan, the Britons Christian) are only the most conspicuous manifestations of some greater submerged antipathy. On leaving the village, Axl and Beatrice are joined by a warrior named Wistan on a mission from his king, and a young boy named Edwin he has rescued from a marauding ogre outfit. Axl and Beatrice’s personal quest becomes entangled with Wistan’s political one, and when they encounter a superannuated Sir Gawain who claims to be on the verge of slaying a she-dragon, but doesn’t seem to be getting very far, matters get slightly complicated, and extremely weird. (See, for example, all that stuff listed in the first paragraph.) Both Gawain and Wistan seem to know Axl somehow; he seems oddly well versed in the courtly intricacies of swordsmanship, and in fact gives off some very heavy Dark Ages Jason Bourne vibes. It’s clear, in other words, that he’s not quite the harmless old codger he believes himself to be, or has forgotten he isn’t. A similar process of slow revelation is at work in the surrounding narrative, where it becomes gradually and unsettlingly clear that the peacetime in which most of the Britons and Saxons believe themselves to be living is really a state of suspended war, an eerily thin tranquility stretched tight over an abyss of bones. 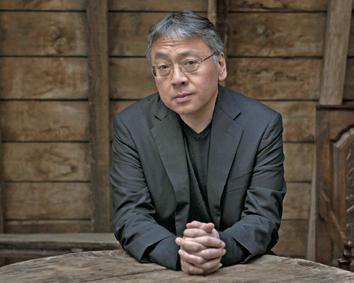 Repression is one of the great themes of Ishiguro’s work—repression, often, of a reality too painful to accommodate. His characters’ vision is often obscured in one way or another. (In a 2008 Paris Review interview, he spoke about an early radio play, rejected by the BBC, in which two people working in a chipper fall in love, neither acknowledging the fact that the other is severely cross-eyed.) Stevens, loyal butler to a Nazi appeaser in The Remains of the Day, is an almost unbearably poignant figure, for the way in which his ideal of dignity has metastasized to the point of strangling his capacity for human connection. Here are the skulls of men, I won’t deny it. There an arm, there a leg, but just bones now. An old burial ground. And so it may be. I dare say, sir, our whole country is this way. A fine green valley. A pleasant copse in the springtime. Dig its soil, and not far beneath the daisies and buttercups come the dead. And I don’t talk, sir, only of those who received Christian burial. Beneath our soil like the remains of old slaughter. And so for all that The Buried Giant clothes itself in the armor of chivalric romance and fantasy, it is also subtly using these formal structures to subvert from within the kinds of national mythologies that are so often built around them. In the opening pages of the book, the narrator tells us he is “sorry to paint such a picture of our country at that time, but there you are.” It’s possible that I am inclined toward this reading of the book because I am Irish, and have a particular view of the history of British empire, but I can’t help thinking that one of the things Ishiguro is doing here is drawing attention to the historical slaughter that lies beneath the fine green valley of England. The Buried Giant unfolds its story and its implications slowly and subtly; as is often the case with episodic narratives, its events can sometimes seem arbitrary, and my grip on the book sometimes slackened in the middle section. But it builds, in its final third, toward what might be described as a devastating anti-climax—the sort of conclusion you don’t realize you’ve been expecting all along until you’ve encountered it. It’s as emotionally ruinous an ending as any I’ve read in a very long time, and it made me circle back to the opening pages, to re-enter the strange mist of this sad and remarkable book. The Buried Giant by Kazuo Ishiguro. Knopf.